Today I’m writing on one of my favourite palmistry topics – the Composite Whorl Fingerprint (see pic – this is from Salvatore Battaglia’s palmistry and numerology reading). In palmistry, fingerprints represent the fixed parts of our personality, including our innate strengths and challenges. Some palmreaders work solely with your fingerprints (see Richard Unger’s book Lifeprints), however I like to use them in conjunction with other palmistry aspects, as well as face reading and numerology. 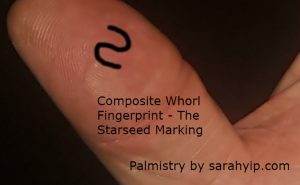 The Composite Whorl is considered a fairly rare print – it is usually seen on the thumb/s if at all, as well as on the index finger. I recently read a palmistry textbook where the author said he had only seen a handful of people with these prints, whereas around 15-25% of my clients have them (as do I). This just goes to show that psychic readers attract clients who are like them – the people we see are not necessarily a perfect cross-section of society. The S-shaped nature of the Composite Whorl gives its bearer the following characteristics, and this is especially the case if the print appears on one or both thumbs*. *The thumbprints give an overall picture of our personality, whereas other fingers cover aspects of our nature (e.g. forefinger is our way of thinking and career). -Good at counselling, facilitating, arbitrating and making fair decisions for other people. -Have a natural connection with other dimensions and space travel/ beings (also known as Star People, or 11:11 Starseeds). -Third eye chakra is more open than average, meaning they can see life after death and the connections between chance events. -Deep interest in spirituality, especially Buddhism or Eastern religions. -Accepting of other races, and may marry into other cultures (especially Asian ones). -Know there is more to life than material success – this is because the print looks like a Yin Yang symbol, which represents true understanding of the Universe (i.e. that good and bad only exist in our minds). y that can be strengthened through meditation and personal growth work. -Because they can always see both sides of an issue, they may procrastinate on important decisions in their personal life (such as changing jobs, relationships or health habits). It’s crucial for them to develop bulletproof faith in their intuition as otherwise their mind will destroy them. Studying spiritual law will help a lot! They definitely need mentors, friends and partners who encourage them to take healthy risks. -Split personality can be an issue, for example being one way in a certain environment and the complete opposite at home. -Some palmists link this print to schizophrenia or manic depression however I would caution against rushing to conclusions. This print is associated with very high intuition/ empathy, and too often in history great visionaries have been medicated or imprisoned simply because of their gifts. -In most palmistry textbooks the Composite Whorl is considered an unfortunate fingerprint because of its link to indecision. Speaking from personal and client experience, I know this handicap can be overcome. I have read the hands of many successful entrepreneurs, musicians and celebrities with these prints, in many cases they were late bloomers who had to learn to trust themselves 100%. Johnny Fincham wrote some helpful advice for Composite Whorl people, which was – if you are 60% sure about something, that is enough. I interpret this to mean take action based on your best guess and get the feedback rather than sitting on the fence.I hope this article has helped you to understand more about the beauty of your fingerprints. It’s called a Double Loop Whorl, not Composite. They are not rare. Read “The Science of Fingerprints” by the FBI. Sarah Yip – Glad to be of help Kit, follow your instincts and you’ll find peace again, I promise. Hi Sarah, I have recently found your article online. The most enlightening so far despite its relatively short length! Just curious if you also take into account toe prints in your palmistry reading? Because logically, I would suspect if the fingerprints tell the nature of a person, then toe prints should say something too right? I have a composite whorl on my right thumb (I’m right handed), and both my big toes and the middle toe of my left foot are also composites. What would you make of this? Thanks a million! Sarah Yip – Thanks so much Keith, yes toe prints do have a meaning, have a look at reflexology as a starting point for the energy and chakras of each toe. I don’t read toeprints but there may be some palmists who do this. I’d suggest the meaning would be similar. Hi Sarah, I follow on facebook but actually stumbled on this article after adding my dads bday as I wrote it on his picture CD from his funeral. 6/26/1962=22 I can’t believe i never noticed he was a 22. He was a genius who from start to finish had a very hard life, was also a alcoholic from very young. It all makes sense now. However, my comment is about the prints. After reading the article you say most people have one or two, I’m an 11 (10/24/1984), and on my left hand I have 4 and on my right 3. My right has one that looks like it was going to be one but it closes off into a circle almost like a tear drop on my index. On both ring fingers I have the circle prints. And my whole life I always saw 10:24, but for the past two years I always and I mean always see 11:11. I had even started taking screen shots whenever I’d see it on my phone but found there just wasn’t enough room to keep up with it. Im extremely A.D.D. and I’m definitely living on the negative side of my life path right now. I’m afraid I’m wasting my potential. My last name (kept private) adds to 22 so I know my time is coming but I’m afraid I’ll miss it. Can you offer any insight for me please. Also I’ve always had psychic type instances throughout life. But I’ve noticed that it’s happening almost on a daily for the past 3 weeks, but I don’t know how to decipher the thoughts till after it manifests usually within 5-10mins after I’ve seen it in my head. Sarah Yip – Hi Misty, thanks for your honest sharing, there’s a lot in your post, so I can only address the main points due to time and ethical restrictions. My sincere condolences regarding your Dad. Based on the DOB you gave he was actually a 32/5, same as my father, they are often geniuses it’s true. I recommend checking out my 11:11 clocks page as you mention many signs of being a Starseed and Lightworker. I’d also suggest numerology studies or books, as the surname you gave adds to a 7 not a 22 so I think maybe learning in a class might help you get clearer on your chart. Being a Master 29/11 lifepath too, I assure you it gets easier with time and as you learn to reach out. I write about this journey frequently, keep an eye on my Find Your Lifepath page or sign up on the homepage for updates. I also have a specific Master 11 Lifepath facebook page. Please, ask for help from people who can work with you consistently, my mentors have literally saved my life and there is no substitute for a strong network of healers around you when you are a sensitive Soul. Hi Sarah, Wow, I’m really intrigued by the amount of spiritual awareness in Brisbane. My life path is 32/5, soul urge number is 34/7 and my destiny number is 53/8. Also growing up in Brisbane, my left ring finger is a backwards S. Which I believe may to do with my destiny 8. Thank you for this article! I’d love to meet you, this website is amazing.’ Alana. Sarah Yip – thanks Alana, yes Brisbane is a 34/7 vibration which is very good for spiritual work and psychic development. Best wishes. I’ve got this fingerprint on my passive (left) hand on thumb and little finger. What does it mean? I also have 7/7/11 as lifepath/expression/soul urge numbers respectively.Ii also have whorls on all the other fingers. Sarah Yip – Hi Ankit, thanks for your comment. I recommend reading Lifeprints by Richard Unger as a starting point for hand analysis. Also check out my posts on 7 and 11 numerology, or consider having a professional reading. There is no substitute for one-on-one learning and personal research. Only you truly know why you came here, other people can simply light the way with your permission. 11:11 Means Peace to All, Especially the Tall Poppies!